I am very lucky to have a studio full of students who are diligent and consistent with daily practice. This has not always been the case in my teaching career, so I recognize what a blessing it is to work with children and parents who understand and commit to the value of daily practice. They make my job easy! I’m often surprised, therefore, that the same attention is not always paid to listening to the Suzuki recordings. My older students keep a daily practice log, which includes a space at the bottom for listening assignments. I’m shocked when a student who has accomplished all the scales, etudes, and repetitive practice of difficult passages I assigned has not also listened to the CD. Listening is supposed to be the easy part! I am always looking for ways to emphasize the crucial importance of listening to my studio families. This weekend, I got to see rock musician Ben Folds perform with the St. Louis Symphony. A very sweet studio parent gifted me their tickets when it turned out they had to go out of town, so it was a surprise treat for my husband and I. Ben Folds is a fantastic live performer and it was fun hearing his music with the orchestra. One moment in the concert really stuck out to me and I knew that I would have to share it here. Ben Folds recorded the hit song “You Don’t Know Me” with Regina Spektor in 2009. At the concert this weekend, Ben Folds explained that Regina Spektor wasn’t able to tour with him all the time, so would the audience please sing her part? Ben Folds and the orchestra proceeded to play “You Don’t Know Me” and without any sheet music, visual cues, or rehearsal, most of the audience sang Regina Spektor’s part in tune and on time. How? Like any good fans, the audience members had listened to this song hundreds of times before attending this concert. They had learned the notes by heart long ago, even if they had never sung along before. So what’s the connection between rock fans being able to sing along at a concert and Suzuki students being able to learn a Minuet by Bach? The answer lies in the education of a student to take what they hear on the CD and translate it into fingerings and bowings on their instrument. This sounds complicated but it’s not. Practically every human being has one set of vocal cords through which they can vocalize and sing. A very imperfect but simple analogy is that the vocal folds are like a rubber band. The more we stretch the band, the higher the pitch. Relaxing the band creates lower notes. In this way, the vocal mechanism can be likened to a single string. String instruments on the other hand (violin, viola, cello, and bass) have 4 strings which are stopped with the fingers. Placing a finger down on the string creates a higher pitch and removing fingers from the fingerboard lowers the pitch. Once the student understands the basic geography of the strings and fingerings, they should be able to play any piece with enough listening. Listening is a tool that liberates the music lesson from the drudgery of learning notes. My students who listen regularly often come in having already figured out the next song (or next couple of songs) in the book and our work in the lesson can be focused on refining technique and musicality. As William Starr writes in his parent education book To Learn with Love: “The student who has all the music memorized will be able to give all of his attention to the problems of playing the instrument. He will not be distracted by reading notes or trying to recall the next note.” The concept of learning the violin by ear and listening to a reference recording every day was one of Shinichi Suzuki’s most important contributions to pedagogy. Lastly, listening can be a joyful experience. The music in all volumes of the Suzuki books is taken from the great classics of the Western Canon. Students are sometimes delighted to hear “their music” on t.v. commercials or classical radio. Rather than being overwhelmed by the news coverage or the endless commercial breaks in Top 40 radio, imagine being surrounded by beautiful string playing throughout the day. I have found that on the days I listen to beautiful music, it changes my perspective and makes me more calm, open and ready to tackle my day. Suzuki had a vision of music education that was immersive, like language. In addition to listening to the Suzuki CD’s, I also encourage my students to attend concerts and to hear great viola playing in many different styles. 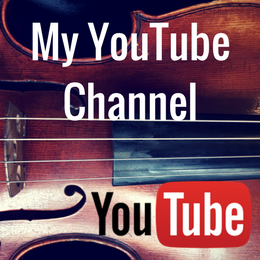 To encourage this special listening, I recently created a YouTube Channel where I am creating playlists of performances for each Suzuki Viola Book, as well as performances of repertoire outside the books, the viola in chamber music, and even some fun pop tunes. It’s important to remember that the Suzuki repertoire exists as part of the larger and varied repertoire for the viola. Once I have finished the viola playlists, I intend to create playlists for the violin books, so my violin students can enjoy some extra inspiration. For another fun example of audience participation, check out Ben Folds “conducting” the audience in a similar concert in Australia! I'm Eliana. I play and teach viola in St. Louis, MO. Here you will find resources and reflections on string teaching and learning, the Suzuki Method, and my library of arrangements for viola ensemble. Videos of ALL Suzuki Book Pieces, Music History, Bow Exercises, and More!